At Prizm Institute, we understand that our students lead busy lives that make it difficult to attend classes while also balancing their other responsibilities. That is exactly why we have designed an online cell phone repair training course that allows students to learn from the comfort of their home and develop skills that will help them pursue a rewarding career in this field. Prizm Institute offers this online cell phone repair training for students and professionals who are unable to attend its classes. Lessons are delivered through a book and DVD package, which allows students to work at their own pace through self-study. All theory lessons are explained in the book, while practical procedures are detailed in the DVD with video tutorials. Get clear, step-by-step instruction on repair methods for iPhones and other smartphones. Once you complete the course, you will be able to troubleshoot and repair any type of GSM or CDMA wireless cell phone brand and model including: iPhone, Samsung, Sony, Huawei and others. This cell phone repair training by Prizm Institute is for people who can’t attend classes at a trade school or technical institute. Due to lack of a cell phone repair school in their area, many people can’t learn it. Others know the basics, but still hesitate to fix handsets especially Apple iPhones from lack of proper training. 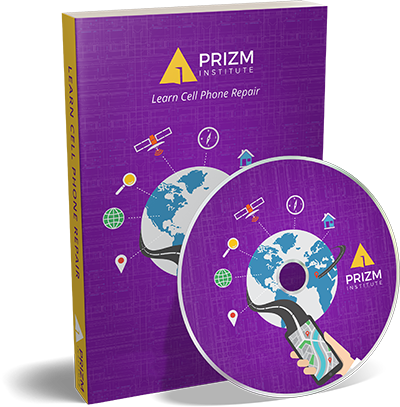 After completing this online cell phone repair training by Prizm Institute, with due practice and fixing a variety of faulty handsets, you too can work as a professional cell phone repair technician and become part of a growing field where there is a high demand for services. Replace charging ports, connectors, switches, etc. Once you successfully complete the course, you will have the knowledge and skills necessary to troubleshoot and repair cell phones and tablets. As you begin to build experience, you will develop advanced skills and become an expert at tackling complicated repairs. Anyone who wants to pursue cell phone repair as a full-time or part-time career. Whether you already own a business and want to expand on the services you offer, or you are looking for a way to become your own boss, cell phone repair provides plenty of opportunities for personal and professional growth. Business owners can include repairs as an additional service for extra income and learn repair skills to supervise their technicians in a better way as well. Anyone above 12 years of age can join this course. The student should have basic knowledge of operating computers. Educational qualification, previous experience or electronics background is not required. Thanks sooo muchhh! I have fixed a couple of phones after the training actually! Received the package and thank you very much for everything, The DVD is very helpful. Its very good training. For me everythings good people now knowing me and i get repairing every day and still good for me i will be always be in touch with you. Thank you for the disc and book, am studying them and they are very helpful. I also want you to help me with advice and any other thing that is required to start a mobile phone repair business. I purchased your cell phone repair course. It is very helpful as far as it goes. We ship the parcel worldwide. The course package should reach your address in 5-7 business days after you make the payment. If you like hands on work and have a love for technology, then this course provides a perfect way to turn your passions into a lucrative career.